Larry Katz was one of the early giants in olfaction, and I am woefully uninformed about his work. Rather than find a recent paper to cast aspersions on, I figured it would be fun to take a look at one of Katz's papers. While we perceive odors as a whole, each odor is a collection of individual monomolecular compounds. In 2006, Lin, Shea, and Katz looked at the relationship between how the brain represents complex, "natural" odors, and the individual molecules that constitute the odor (I put natural in quotes, since odors like coffee are not something a wild mouse would encounter, but that's just me being pedantic). To start, they performed intrinsic signal imaging on the dorsal olfactory bulb of isoflurane anesthetized animals, while applying natural odors like cinnamon, cloves, and cumin. Of the 60 natural stimuli tested, 14 evoked "weak" activity (1-5 glomeruli), and 9 evoked "strong" activity (5+ glomeruli). The glomerular responses were complex, with some glomeruli being activated quickly after odor presentation (within 1s), while others could have a delayed response more than 6s after stimulus start. Then, to break down the odors into their components, they performed gas chromatography (GC) on a subset of the strong odors, and presented the results to the mouse. While the "strong" odors as a whole activated many glomeruli, during GC, individual glomeruli were activated at different times. Gas chromatography presented to the mouse activates individual glomeruli. One interesting aspect of this response is that the largest peaks (representing the most molecules) do not correspond with the largest glomerular response. Lin quantified how many times each glomeruli was activated, and found that most glomeruli were activated only once, suggesting that the response to the natural odor was simply a linear summation of the response to individual components. The response to clove (C) is similar to the summation of individual components (E). The individual components were identified from GC (compare B and D). Overall, the similarity between the summed GC response and the natural odor response was 80%. Why not 100%? Besides the fact that the GC response was not entirely consistent between trials, gas chromatography involves heating molecules to high temperatures (200C+), which could change the structure of molecules. Indeed, when they burnt clove, it increased the similarity between the natural map and the summed GC map. One last thing they tested in this paper (and to be honest, a somewhat tangential story) was whether structurally similar molecules activated the same glomeruli. So they applied a bunch of similarly structured molecules (alkyl aldehydes I think), to see which glomeruli they activated. And while there was some overlap, it was not complete. From this they conclude that the receptive field of glomeruli are more complex than simple feature recognition, and involves multiple features of each molecule. All in all, a pretty cool paper. It seems a little too clean, in that the GC components usually activated single glomeruli, when we know that single molecules can activate a large number of glomeruli. 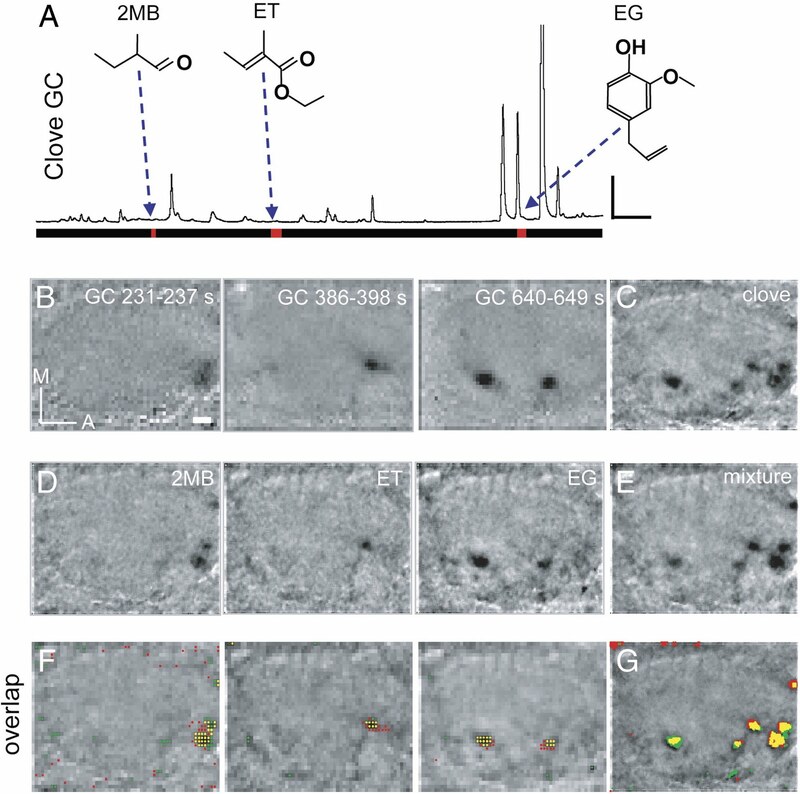 But the use of GC as a way to separate individual odor components is pretty cool (it apparently was done before with humans), and directly address the question of odor composition while dodging questions of concentration. It also makes sense that at the glomerular layer, which in some ways simply relays olfactory sensory neuron information, the processing is simple and linear (ignoring dendro-dendritic inhibition and such). The big question, though, is what happens downstream when these multiples signals interact, and how natural odors are represented in the mitral cell layer. But that is a question for another trip down the paper trail. 1. Lin DY, Shea SD, Katz LC. 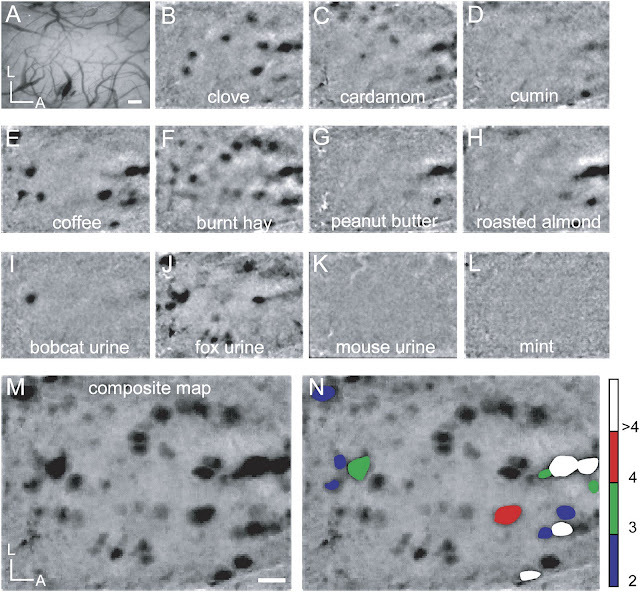 Representation of natural stimuli in the rodent main olfactory bulb. Neuron. 2006;50(6):937-49. Available at: http://www.ncbi.nlm.nih.gov/pubmed/16772174.